It was a boisterous celebration at the West Seattle Elementary (WSE) assembly last Friday, when brand new Brooks running shoes were distributed to the 44 winners of a physical activity competition that was spurred on by last October’s IWALK Challenge. 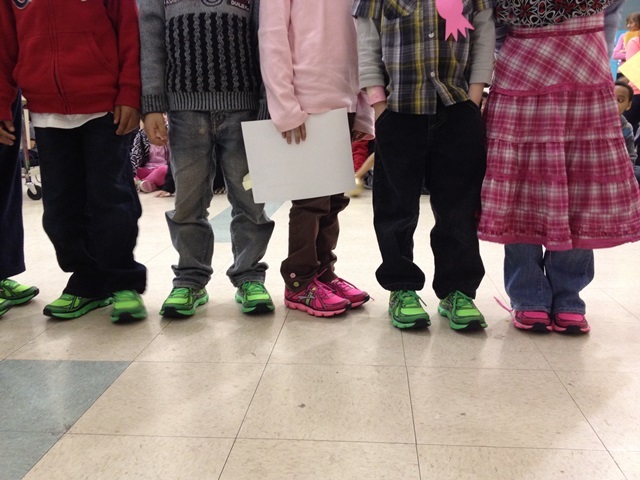 The gymnasium was aglow with bright pink and green shoes, not to mention the beaming smiles of the kindergarten and 2nd grade students who wore them. 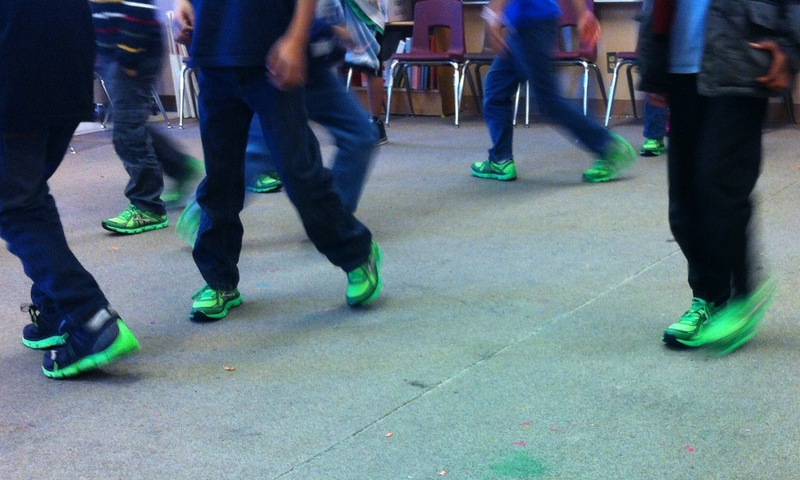 The Brooks shoe donation originally came to WSE in October, when the school won the “shoes for a classroom” prize in the Feet First International Walk to School Day (IWALK) Challenge. (See previous coverage of that event here). Bermes and the school nurse, Terri Helm-Remund, then worked with students in the”Healthy Husky Club” to find a fair, fun, and healthful way to determine which class within the school would receive the actual shoes. When two classes ended far ahead of the pack, but in a virtual tie with each other, Brooks offered to increase their donation to cover all 44 students. Congratulations, West Seattle Elementary. Your dedication to student health and education is extraordinary! And thank you, Brooks, for your generous support of West Seattle Elementary and the Feet First IWALK Challenge. Inspired by the students at West Seattle Elementary? Get your school moving in the right direction, by creating a campaign that works for your school.